The Mitsitam Cafe’s serving area and menu are divided into five regions. 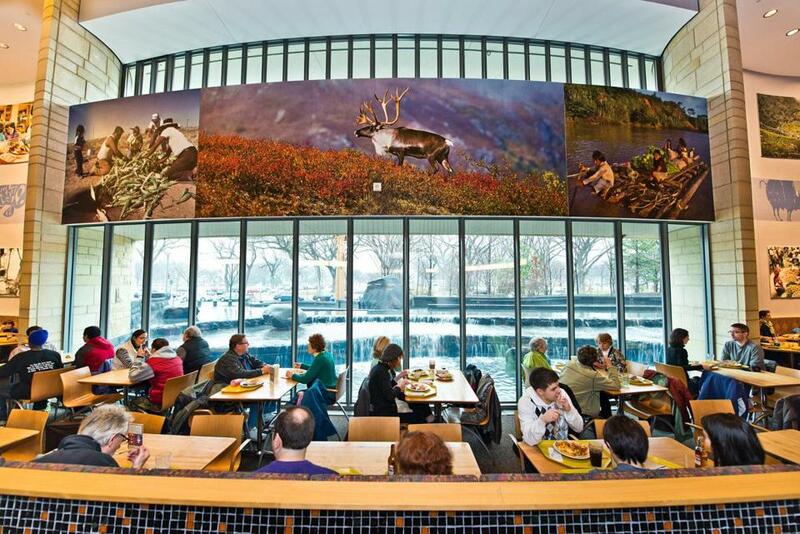 WASHINGTON — Step into the Mitsitam Cafe at the Smithsonian’s National Museum of the American Indian and you’ll quickly realize you’re not in for typical museum fare. Absent are cardboard pizza and cold fries. In their place are grilled bison strip loin with red currant sauce and pork shank marinated with hibiscus and chocolate. This extensive showcase of Native American cuisine is executed admirably. The cafe features a daunting array of hearty, wholesome dishes that make use of ingredients and cooking techniques popular with the indigenous peoples of North and South America. Executive chef Richard Hetzler sees this as one big edible living exhibit, in which visitors literally get a taste of the cultures represented elsewhere in the museum. Both the menu and the cafeteria-style serving area are divided into five regions: Northern Woodlands, South America, Northwest Coast, Mesoamerica, and the Great Plains. 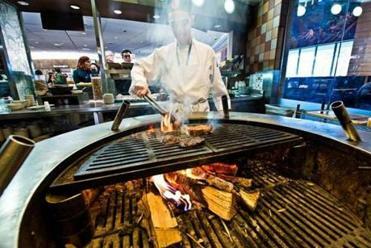 The focal point is in the Northwest Coast section, where two richly colored sides of salmon face off, each lashed to a charred plank of cedar suspended over a wood fire. The fish is not just for show. It appears in dishes like horseradish-crusted salmon with huckleberry chutney. Over in the Great Plains, a carving station offers slices of moist, maple-brined turkey. Baskets of slightly purple cornbread — made with blue corn — adorn the South America section, and bags of pumpkin cookies and little sacks of wild rice line the way to the checkout: ancient impulse buys. The space inspires a sense of abundance and celebrates ingredients like tomatoes, corn, and chocolate, which originated in the Americas. Mitsitam (“let’s eat” in the native language of the Delaware and Piscataway tribes) is also a reminder that many dishes associated with modern countries are nothing new. Ceviche, tacos, clam chowder, and chili all have roots in native cooking and are featured here in their respective regions, though the menu changes with each season. Buffalo makes several appearances, as in burgers that combine ground buffalo brisket and duck confit. These and a wild rice salad are two of the most popular items. The nutty, tangy salad includes dried cranberries, pine nuts, and pumpkin seeds, all of which were popular well before the arrival of Columbus. Many desserts are only slightly sweet, made for the most part with maple syrup, agave nectar, or other precursors to white sugar. However, the agua fresca selection runs a tad too sweet. These lightly flavored water-based drinks are popular throughout the Americas and predate today’s commercial flavored waters by centuries. The cafe stocks a rotating assortment of one beverage from each region, and on one visit that included blackberry with pinole (ground, roasted corn), lemonade with chia seeds, tamarind, and blueberry-green apple. The museum is the most prominent example of a growing movement to preserve and promote indigenous cooking. 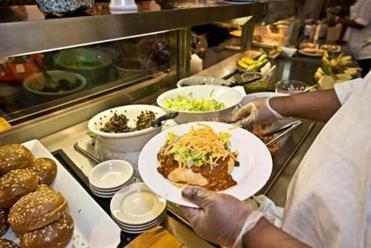 Other establishments include Tocabe in Denver, which has been called a Native American take on Chipotle, and the restaurant at the Hopi Cultural Center in Second Mesa, Ariz.
Prices are somewhat higher than at most museum cafes ($9.50 to $22.95 for entrees), but so are standards. The five-region sampler platter ($29.95 for two) is an efficient way to sample around. Ingredients are shipped in from the source. Wild salmon is caught by tribal members of Quinault Pride Seafood in Washington State and spends as few as 12 hours out of water before going over the fire. Buffalo are raised on tribal lands and purchased from the Intertribal Bison Cooperative in South Dakota. In 2012, the cafe added an espresso bar, which brews beans that are sourced, roasted, and even distributed by indigenous peoples. Duck, lamb, and salmon arrive whole in the kitchen. It is something of a cliche to say that Native Americans traditionally used every part of an animal and only ate what they grew. The cafe tries to honor that. American Indian Independence Avenue S.W., Washington, D.C., 202-633-6644,www.mitsitamcafe.com.